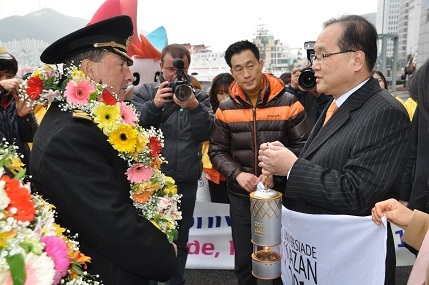 The Torch arrived at the port of Busan and was handed over to Kim Yoon-suk, secretary general of the 2015 Gwangju Summer Universiade Organising Committee, by the captain of Sedov, the sailing boat which the torch was travelling on, Nikolay Zorchenko. Twenty honorary ambassadors of the 2015 Gwangju Universiade, known as "Uni-friends", met the torch in a ceremony, which aims to boost the profile of the Games in Korea. The Universiade Torch has travelled around the world since setting off from Paris in July 2012, visiting France, Morocco, Brazil, Argentina and the Philippines before it is due to return to Russia on January 25 in Vladivostok to begin a nationwide tour. 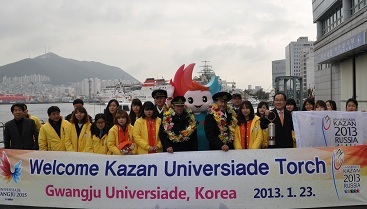 The South Korean city of Gwangju will host the 2015 World University Games and this will be the first time South Korea has hosted the Games. Gwangju have stepped-up their promotional efforts recently, bringing in Olympic double gold medal-winning archer Ki Bo-Bae and pop group Sweet Sorrow amongst other South Korean celebrities to endorse the Games. The official Facebook page for the 2015 Universiade currently has over 5,000 "likers", with the official Twitter page boasting over 10,000 "followers" with over two years to go until the event gets underway.